← Paul Krugman: Are We Living In A Permanent Depression? 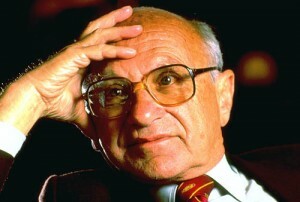 Friedman was best known for reviving interest in the money supply as a determinant of the nominal value of output, that is, the quantity theory of money. Monetarism is the set of views associated with modern quantity theory. Its origins can be traced back to the 16th-century School of Salamanca or even further; however, Friedman’s contribution is largely responsible for its modern popularization. He co-authored, with Anna Schwartz, A Monetary History of the United States (1963), which was an examination of the role of the money supply and economic activity in the U.S. history. A striking conclusion of their research was regarding the way in which money supply fluctuations are contributing to economic fluctuations. Several regression studies with David Meiselman during the 1960s suggested the primacy of the money supply over investment and government spending in determining consumption and output. These challenged a prevailing but largely untested view on their relative importance. Friedman’s empirical research and some theory supported the conclusion that the short-run effect of a change of the money supply was primarily on output but that the longer-run effect was primarily on the price level. This entry was posted in deficit, economists, economy, milton Friedman, money, nouriel roubini, paul krugman and tagged budgets, cash, china, entertainment, finance, hedge funds, milton friedman, money, nouriel roubini, obama, stock markets, stocks, tech, technology, us deficit, wall street, world bank. Bookmark the permalink.